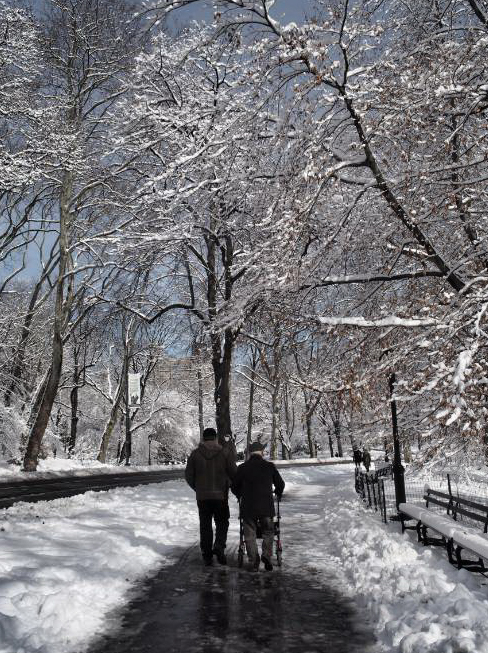 I am honored to be counted among the winning photos for Walking in a Winter Wonderland—a photo I snapped quickly while walking on a beautiful winter day in New York City’s Central Park. I typically snap photos of people from behind. I like the mystery—Who is that person? Where did she come from? Where is he going? I also like the way you see someone when not distracted by their faces. The focus becomes on how a person is moving. Is she using an assistive device like a walker or a cane? Is a friend or caregiver supporting him with a gentle hand or the offer of an arm? Is an older couple walking hand in hand as if they were 22 and just married? I rarely submit my photos to contests but I was drawn to the idea of the “Friendly Faces, Friendly Places” contest that John Feather so aptly captures in his quote above. 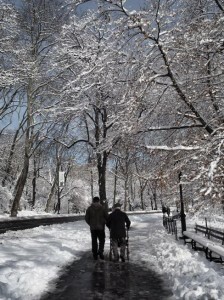 I happen to think that Central Park is one of the most age-friendly parks in the world. There are plenty of paved walk ways and benches upon which to rest and watch the rest of the world go by at every turn. New York City has this reputation as being big and burly—a place where young people come to make their way. The less known side of the city is what an age-friendly place it can be. Thanks to GIA for hosting this contest and giving professional and amateur photographers alike a chance to show off why we think our communities are age friendly. Nancy Lundebjerg is Chief Operating Officer of the American Geriatrics Society and the Health in Aging Foundation. This entry was posted in Things We Like by Nancy Lundebjerg. Bookmark the permalink. They say a picture is worth a thousand words, and I love seeing pictures of our older adults out and about in a Friendly Place. I’d love to see pictures of some of the older adults we care for in their favorite places as well; we just had several WWII Vets go on an Honor Flight, and they had a great time in Washington, DC. As for Florida, we have *lots* of favorite places and older adults, And for those who don’t know, Nancy is a great photographer and you will be happy if you treat yourself to browsing her Instagram!